NOW: With the historical prospect long lost, first to a garage and then to the Interstate 5, Jean Sherrard took his repeat from near the northeast corner of Sixth Avenue and Spring Street. Moving left to right from the center, crowding the right horizon are the Tudor-Gothic styled Exeter House, the nearly completed Cielo Apartments, and the terra-cotta-tile clad Town Hall, all rising from their respective corners at Eight Avenue and Seneca Street. We may puzzle over why the unnamed photographer of this wide look through a First Hill intersection chose also to feature the trash and weeds in the foreground. As revealed in Jean’s repeat, this intersection at Seventh Avenue and Seneca Street became a small part of the concrete ditch cut for the Seattle Freeway. In the early 1960s, here at Seneca Street, Interstate 5 construction through the central business district turned due north and continued along the green-belted side of Capitol Hill. Although the freeway took this entire intersection, it needed only a slice of its southeast corner, the part shown here on the right of the “then” with the small grocery. “Homemade Bread” is signed below the corner window, and directly above it, “Sanitary Grocery” is printed on the window. In the commercial listings of the 1918 Polk’s City Directory, it was but one of more than 750 small grocery stores that the ‘invisible hand’ of capitalism had scattered through Seattle. Often referred to as “mom and pop stores” – in part because it usually took a family to run one – the First Hill neighbors of this grocery located at 1122 7th Avenue would likely have found Katherine and Jewett Riley behind the counter. Jewett, at least, was an old hand at mercantile, having helped his brother Silvanus run a store at the Leschi Landing soon after the Yesler Cable line was completed to Lake Washington in 1888. In 1918 Katherine and Jewett conveniently lived in unit 104 of the Touraine Apartments at 711 Seneca. Directly behind the grocery, the Touraine is four stories tall. Van Siclen Apartments facing 8th Avenue between Seneca and University Streets. Judkins 1887 panorama looking north from the Central School tower on the south side of Madison Street between Marion and Madison shows Seventh Avenue ,on the right, heading north towards its intersections with Spring and Seneca Streets. The little home on lots north of the northeast corner of Seneca and Seventh can be found in both Jjudkins pan and in the feature photograph at the top. CLICK TO ENLARGE – by all means. The oldest subject here is the comely little home to the left of the big box of a boarding house at the intersection’s northeast corner. It dates from the mid-1880s. To the right of the boarding house, the concrete Van Siclen Apartments (1911), with rooftop pergola and ornate row of arched windows, faces Eighth Avenue between Seneca and University Streets. It is a block so steep that the paved Eighth cannot be seen from this prospect. In the vacant corner lot to the south (right) of the Van Siclen, the Alfaretta Apartments at 802 Seneca was built in 1918. Jean’s 2012 portrait of the Alfaretta’s deconstruction, with the surviving Exeter House beyond it on the west side of Eighth Avenue. The Van Siclen (later renamed the Jensonia) and the Alfaretta missed reaching their centennials. Both were razed in anticipation of the rising of the 323-unit Cielo Apartments at the northeast corner of Eighth and Seneca. As a work-in-progress, the Cielo can be readily found in Jean’s repeat, rising above the Exeter House (1928) and Town Hall (completed in 1924 as the Fourth Church of Christ Scientist). Freeway Park waders in the summer of 1976. Photo by Frank Shaw. Anything to add, Paul and Ron? Surely, starting and perhaps ending with the dozen links below. They are, again and again, well stacked with relevance – sometimes repeating it. For instance, beginning with the first link below. You can find, surely, the Christian Scientists on the left – now TOWN HALL – but also the rear of the of the Van Siclen apartments on the far right. Until only a few years ago they faced 8th Avenue mid-block between Seneca and University Street. The view to the bay over the retail district was wonderful until the Freeway overpass blocked it in the 1960s. Somewhere in the links below the fuller Van Siclen story is told. My great-grandfather owned this parking lot and I enjoyed seeing this and other photos of the scene. The first corner was taken by eminent domain, and the rest taken at a later time. The fees for the lot were to support my grandmother, but in the end, compensation was not very generous for the land taken. I have the documentation from the city and court case. 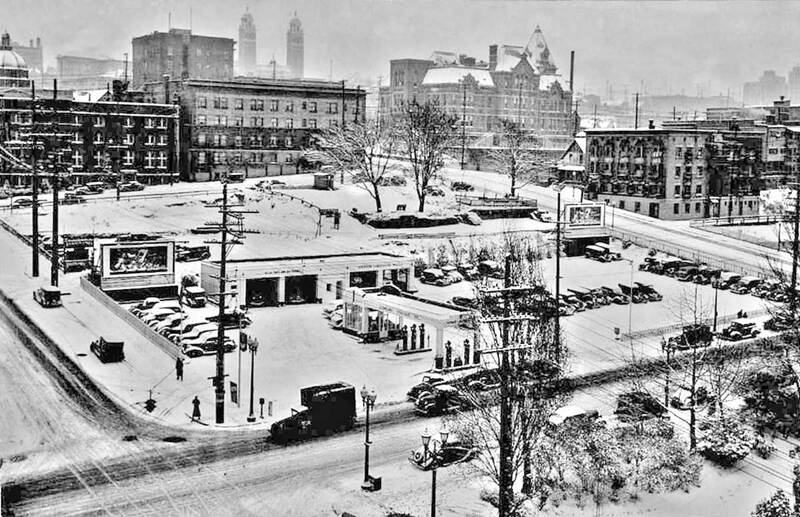 My father proposed building a parking garage on the location, but the city took the land, and surprise-surprise – built a parking garage which stands there today.